Authored by: Anne Maczulak, Ph.D. Humans have always struggled with how to balance the benefits bacteria offer with the threats that they produce. Much less obvious than the effects microorganisms have on plants and animals are the indirect ways in which they shape the planet. These hidden activities have rarely been explained in science, though scientists realize that the behavior of microbes supports all life on Earth. 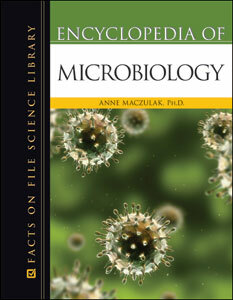 In more than 200 entries, Encyclopedia of Microbiology presents the myriad ways in which microorganisms influence the biosphere. Focusing on how all microorganisms relate to each other just as all higher organisms relate to all other animate and inanimate objects on Earth, this resource explores all aspects of microbiology from mycology (the study of fungi) to the simplest biological entities of all, viruses, to prions, which are even more streamlined than viruses and just as dangerous. Biographical sections in many entries highlight the scientists who most influenced developments or discoveries in microbiology, including Louis Pasteur. Entries cover new techniques in microscopy, genetic engineering, gene therapy, and nanotechnology. A full-color insert, helpful appendixes, cross-references, and further resources round out this invaluable resource. Does Immigration Lead to Increased Incidence of Disease? Will Global Warming Influence Emerging Diseases? Does Vaccination Endanger or Improve Our Health? Does Air Travel Make Us Sick?